Today is Social networking world. Everyone connected with each other with the help of social networking. Facebook is number one social networking website.Its growth is very powerful.Today,we will talk about social media buttons.You can add these social media buttons in your blog.You will get huge traffic with the help of floating social media buttons. In these social media buttons you will get Facebook Like, StumbleUpon, Digg, Tweet, LinkEdin & Google Plus etc.You can set these buttons on left or right side of your blog. I will suggest you for sharesidebar. You can choose the position for widget left or right. To obtain an embed to be installed in a blog or website, you must leave a valid email address and, of course, enter the URL of the domain in which you want to show. This will show floating buttons on your blog. This widget will fixed on blog screen. 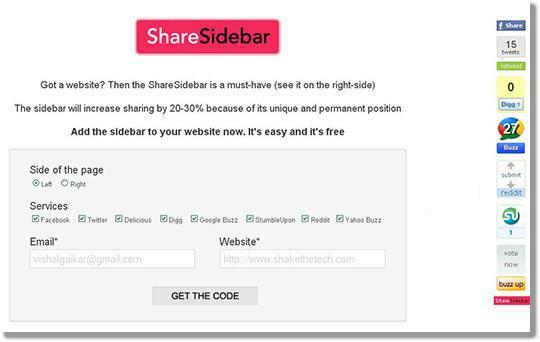 So try ShareSideBar : Get it for your website ! I hope you enjoyed this tutorial. You may share your opinions via comments.